Celery has become a common household staple along with carrots, onions and potatoes. Its crunchy texture and distinctive flavor makes it a popular addition to salads and many cooked dishes. Although it is available throughout the year, you will enjoy the best taste and quality of celery during the summer months when it is in season and locally grown varieties can be easily found in the markets. Celery grows to a height of 12 to 16 inches and is composed of leaf-topped stalks arranged in a conical shape that are joined at a common base. It is a biennial vegetable plant that belongs to the Umbelliferae family whose other members include carrots, fennel, parsley and dill. While most people associate celery with its prized stalks, the leaves, roots and seeds can also be used as a food and seasoning as well as a natural medicinal remedy. I love casseroles and never tired of it. The kitchen smelled good while this casseroles was baking. And taste even better. Next day for lunch we had leftovers, so good. I hope you try this one. 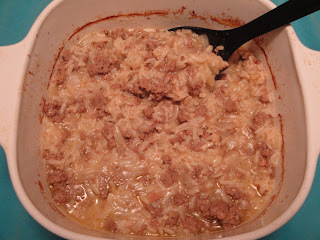 In large skillet, heat oil over medium high heat, add ground turkey, onions, celery, worcestershire sauce, salt, pepper, and garlic, cook until no longer pink. Stir in soup, broth and rice. Spoon into prepared casserole dish, cover, bake for 45 minutes, until rice is tender. Enjoy! What a yummy casserole! A great comfort dish! Glad to come across this recipe. Usually when you find one for ground turkey it seems like people think they need a zillion ingredients to make it flavorful. This recipe is proof that with a few well selected ingredients, turkey can make for a flavorful meal. I like one dish meals to and this looks to be a winner. Enjoy the day! Thanks for the celery facts! I had no clue!!! I love casseroles. Such an easy way to get a flavorful meal and your recipe seems simple and delicious!